NASA owns the moon then? Sounds pretty arrogant to me. No, they are only claiming ownership of the materials that they spent the money on to retrieve and bring back to Earth. If you go and collect your own samples then that is a different matter. >If you go and collect your own samples then that is a different matter. Only if you also finance the trip. ...like American TAX PAYERS ! If you go and collect your own samples then that is a different matter. I'd say even by that measure this particular case is a bit muddy. Armstrong DID go and collect those samples and gave one to a friend's daughter. The argument could be made that NASA paid to get him there, but I think - just my opinion - that it'd be a hard sell to say he couldn't get something for himself while he was there in between all the samples he collected for NASA. And if he could get something for himself them he could also give it away. They went there with an aim to collect materials as part of the mission. As with most companies, if you produce something whilst doing your job the stuff you produce/collect belongs to them. True, but things are a little different with jobs where you're on the job 24/7 for long periods of time. Think of it this way: if a soldier is on mission someplace exotic and takes a few seconds to collect some sand from the beach in a test tube as a souvenir in between doing other things, does the military own that vial of sand? Of course not. I don't really think that the fact that very few people have been to the moon and had that chance to grab a vial of moon dust changes the situation that much. He collected samples for NASA and took a few seconds to collect one for himself, as anyone else who has a job they can't leave at the end of the day would have been allowed to. Just because he was paid to go there doesn't mean every speck of everything he brought back automatically has to be the property of his employer. That might work with the grain of sand argument but it's a whole lot different if the soldier brings back a pouch of gold nuggets even if honestly collected. You betya that there would have been military regs about taking anything of value. Except with most companies, you have a work day, and if you go for a walk in the evening and find a pretty rock for your collection at home that doesn't become the company's rock. Actually the Apollo program, like everything else at NASA, was funded by the US taxpayers, which in my view places moon dust clearly in the public domain. But even if you take the neoliberal view that everything should be privately owned, regardless of whether it was funded by leaching from the public purse, we're talking about a tiny sample of dust - where NASA already has a vast hoard of lunar material, collected decades ago, then accepted as a gift in good faith. NASA literally chasing every last speck of moon dust just seems like senseless greed, under the circumstances. "Actually the Apollo program, like everything else at NASA, was funded by the US taxpayers, which in my view places moon dust clearly in the public domain." NASA owing it would keep the mood dust in the public domain, since NASA's ownership is itself in the public domain. This woman owning it would place it in the private domain. I did, I hired NASA to collect them for me. I am pretty certain that NASA didn’t pay for anything unless the astronauts got part time jobs mowing the lawn’s to fund the space shuttles. Whose tax dollars paid for NASA to go to the moon again? no they dont own the moon. I don´t own the desert in Jordan either but the small vial of purple sand that I brought back with me is mine. I paid for the transport to get there, I went out a collected it and I brought it home. I don´t really understand why NASA are being so up tight about this though, maybe to discourage further resales of things that they made possible to collect and would prefer to keep for their own research or display. It will make for a great provenance story at auction if she gets this back though. Because if it was legal for someone to own lunar material with a thimble-full potentially worth a million dollars, a thriving market of counterfeits would spring up overnight which would quickly spiral out of control. It would include fake moon dust, fake rocks, fake experts, fake labs, fake lab results, and real murders. "Because if it was legal for someone to own lunar material with a thimble-full potentially worth a million dollars, a thriving market of counterfeits would spring up overnight which would quickly spiral out of control. It would include fake moon dust, fake rocks, fake experts, fake labs, fake lab results, and real murders." And as any fule know, the moon landings were fake too! Both the lunar module and the service module burned up, as planned, during the trip back to Earth. No fuel could be recovered from their engines, so their was no marginal added cost for transporting those few extra grams of moon dust. "could there be freight charges involved?" 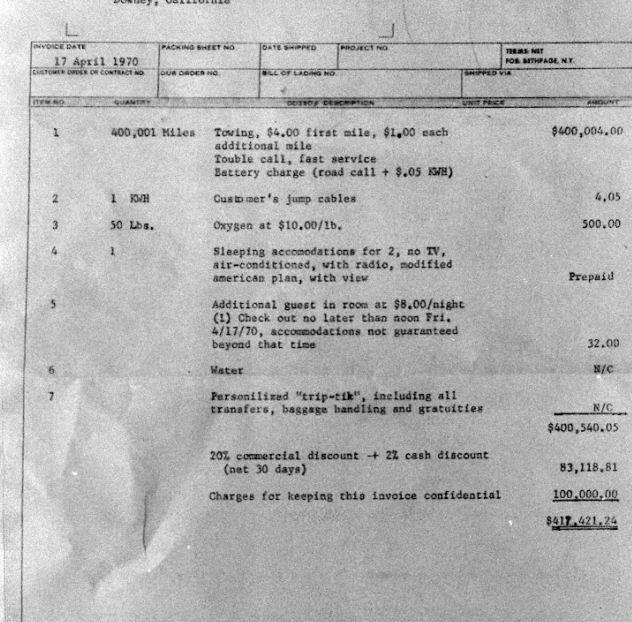 "Reminds me of the towing invoice for Apollo 13"
I think they are due a refund for "Charges for keeping this invoice confidential". "I don´t own the desert in Jordan either but the small vial of purple sand that I brought back with me is mine." I wonder where the line is drawn. Sure, collect a small vial of sand and it's yours, but several tonnes of sand is likely not yours to take. "I wonder where the line is drawn." I wouldnt bet on it - you may have collected it but did you have permission? I'd bet it counts as stolen. The ongoing ruthless take backs. NASA, for a long time now, has been pretty ruthless in taking back every bit of moon dust and rocks that were given to people. It's so ruthless and unnecessary that I can't help but wonder if they are hiding something. Re: The ongoing ruthless take backs. Yeah they don't want anyone finding out about the hidden NAZI Bunker on the Moon, with the Three Monoliths just down the hall, and to the left. We also shouldn't forget the fourth monolith, designed to be laid across the top of the other three, in order to form some kind of gate-like structure. Three vertical, one horizontal across the top? Sounds like a wicket to me! Wonder where the bat and ball are? Have you seen how many craters there are on the moon? "Three vertical, one horizontal across the top? Sounds like a wicket to me! Wonder where the bat and ball are?" Ah, an artifact from the Krikkit wars . * Not much of a fan when it comes to censorship, but this was a case where the american version got it right. "* Not much of a fan when it comes to censorship, but this was a case where the american version got it right." fully agreed! I remember bursting our laughing at that line when I first read the book. I was at an age where an F-bomb would have been inherently funny, but Belgium was so much funnier in context. Fell into disuse after the whole thing was found to be impractical - play kept stopping for bad light for stretches of 14 days at a time. Hans. You do know that cricket has nothing to do with sport? It's an old British weather control system. So, do mean that if you schedule a game then it rains at game time? That's a great way to ensure an area has sufficient ground water and it then appears that there must be a much greater number of cricket players here in the Province of New Brunswick, Canada than I would have thought. Are they called the Belgian Marbles? And you forgot to mention they don't want to admit Mr Spoon was left there. "Yeah they don't want anyone finding out about the hidden NAZI Bunker on the Moon, with the Three Monoliths just down the hall, and to the left." It might have something to do with mineral rights. Not sure but I recall something from the 60's on this. They obviously don't want us finding the WW2 bomber they've hidden up there. that some people around here might know about that. One small vial of dust for mankind, one giant leap for lawyerkind. Space is free for all nations to explore, and sovereign claims cannot be made. Space activities must be for the benefit of all nations and humans. Most major players have signed this. The moon and its natural resources are the common heritage of mankind. None of the majpr players have signed up, too busy looking at the profit ! 2. Does this prevent any organisation or person in procession of some Moon from selling it? But I think the last couple of minutes from 'Iron Sky' is far more likely or possibly a re-run of the East India Company that became defacto state. Iron Sky ... damn I wish they'd hurry and release part two. Why did they put a flag on it then? Re: Why did they put a flag on it then? While the ownership of moon rock/dust/dirt brought (returned?) to earth via Apollo probably does rest with NASA, I see no reason to treat anyone else in possession immediately as a criminal, just show them a court order (supreme would be nice) saying it's ours - now hand it over and we'll be on our way. I doubt any recovered samples would be considered fit for analysis now beyond proving it is actually moon dust. On a lighter note, how did the astronauts get their trophies past officialdom in the first place? It was presumably a different place back then, when things were more relaxed, less lawyered-up. I imagine if an astronaut asked if they could keep some physical memento of their ventures it was often simply 'sure, why not'. Only later did they come to see that The Precious had escaped their clutches and, since then, seem to have ruthlessly attempted to take back everything they can. "I doubt any recovered samples would be considered fit for analysis now beyond proving it is actually moon dust." My Dad cam home with a vial with a lump of moon rock in it that had been passed to the university he worked at. Never opened the vial but it came within 1/16th of an inch of my hand. Boring looking TBH, but what it did to my imagination! It's probably just one of the pots of pepper he gave out to make people happy. Who is going to sprinkle it on their steak to find out? ...well if it was moondust and I sprinkled it on my steak and ate it, then when I popped my clogs and was cremated then my surviving rellies would have a lot more to work with and could bottle me up for sale with a legitimate claim of "contains real moondust". So a sort of " Homeopathic " Moon dust then. The article was posted in the Science section. Moon dust is awfully carcinogen... great for all sorts of mad science, but carcinogen nonetheless... Ask Cave Johnson! So what's going to happen if some being from the moon comes to Earth, pilfers something pretty important/valuable and takes it home, only for someone from Earth to go to the moon and retrieve it? Finders keepers indeed if you can make the round trip without being noticed! but what would be worth the cost? All they have to do is nick, for example, all Van Gogh's works. As superior beings, they will have nailed teleportation (so the initial capture is easy); all the Earth-based compatriate has to do is get to the moon and back. For many oodles of mega $, that should be easy. "All they have to do is nick, for example, all Van Gogh's works. As superior beings, they will have nailed teleportation (so the initial capture is easy); all the Earth-based compatriate has to do is get to the moon and back. For many oodles of mega $, that should be easy." Artifacts, Not samples, rocks or dust. Who got the ray gun? They almost want to encourage the conspiracy nuts. Yeah, I get it that a market in fake moon or other space stuff would be bad as well (maybe a zillionth as bad as the drug market? ), but gee, this is heavy handed. It's not like NASA was losing anything by not having this vial, or was planning on selling it to recoup costs...that, um, we taxpayers paid, not them. "Armstrong - who was the first person to set foot on the Moon"
Re: "Armstrong - who was the first person to set foot on the Moon"
"Thanks El Reg, it's these insightful editorial nuggest of information that keep us all coming back for more"
Well, it was a long time ago, probably before some of the readers were born. Are you feeling old yet? Re: "Are you feeling old yet?" Worse than that is having coherent conversations about politics with people who were barely born when 9/11 happened. "nasa hiding the truth the soil came from area 51 then"
Looks like someone at NASA has read Moonseed and decided better safe than sorry. Who actually has the dust in their possession? Is she suing because NASA nicked it off her and she wants it back, or is this preemptive? "The Earth does not belong to us: we belong to the Earth". Everything is ultimately made from non-material waves, so ownership is a fleeting illusion because there is nothing to own. That's deep you should send that into the Readers Digest. They got a page for people like you. The reason they must have the rocks and dust they claim fame from the Apollo Moon missions is quite simple. They lied to the world and never went to the moon. They were in low earth orbit the entire time. The rocks came from Antarctica. They went there right before Apollo to gather meteorites and took them back to NASA ceramics lab where they pulverized some to dust. That’s why it has earth dust mixed in. Moreover, some of the “moon” rocks they gave to various countries were eventually tested and were nothing more than petrified wood. So, to prevent more embarrassment, they want the fake samples back. Supposedly the moon is rich in rare metals and helium 3. If we could go to the moon, we would be there now. Think about it. It’s like the wright brothers 1st flight and 60 years later it still hasn’t been repeated. A certin CEO over at Aperture Science would love to get his hands on the stuff. Am sure I saw a documentary where someone had built a Lunamax prison to house undesirable Aliens? Ageist Elder Abuse by Law Enforcement? "the 74-year-old and her husband were grilled.. for two hours, where she wet herself after pleas to use the toilet were ignored." I go for the Allende meteorite with real interstellar microdiamonds ****. ummmm....who`s money does NASA spend ?????????????????? ?